Samsung has been doing its best to stay competitive in the smartphone industry. 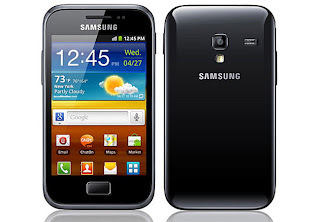 And the company has just released the latest handset, Galaxy Ace Plus. Details after the break. Some of you would remember the Galaxy Ace released last year. Galaxy Ace is a follow up to that phone. It has some features normally found in midrange phones such as an 3.65-inch HVGA display. Apart from that, the inside of the phone contains 1GHz processor with 512MB of RAM, a 5 MP camera, TouchWiz and Gingerbread 2.3. The phone is expected to release in Russia this month. Latin America, Europe, Africa, Asia and Middle East will have to wait for their respective releases. Looks like Samsung is gearing up for 2012. Let's see how they do against the other giants of the industry in this new year. 0 Respones to "Samsung Presents New Galaxy Ace Plus Entry-Level Phone"